Jews, haven't you heard? Propaganda is the new black. Revisionist history has replaced history. Never mind that you have a few thousand years of bona fide history on the Temple Mount. That's nothing compared to a few years of Palestinian faux history. And never mind that the God of Israel stated emphatically that the Temple Mount was the one place out of all the places in the world that He chose to place His name. This is 2013. Things change. Or at least that's what the majority of the world wants you to think. Didn't you get the memo? 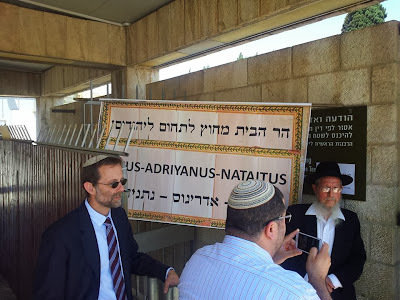 The Muslims want the Temple Mount to be solely theirs; you know, Judenrein. The Muslims have a hard time sharing. And when they're told to share, they throw a fit. So the world gives them what they want. 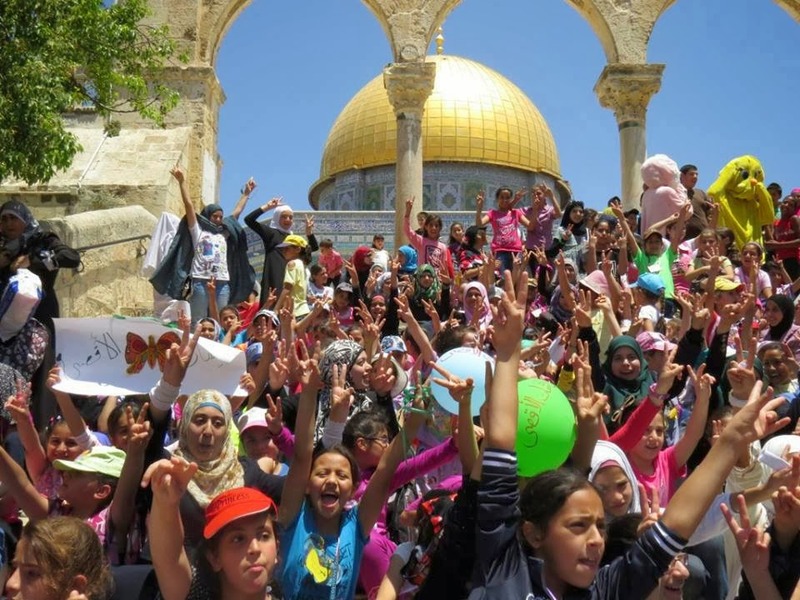 And because of that grown-up kind of logic, you can't exercise your rights on the Temple Mount. In essence, the Temple Mount no longer belongs to you. So quit acting like it does. 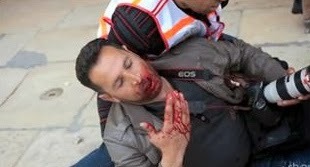 In order to help you let go of your desire, need, duty, whatever you call wanting to ascend the Temple Mount, I'm going to give you a head's up of what is now considered proper behavior on the Temple Mount. 1. 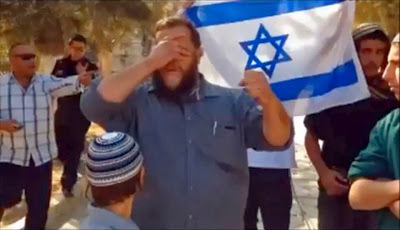 Do not, under any circumstances, wave a flag that is blue and white and has a star of David on it while on the Temple Mount. Such audacious behavior will get you arrested. However, it is perfectly fine to wave a green flag representing the terrorist organization Hamas, or a Palestinian flag representing a made up country. while on the Temple Mount. 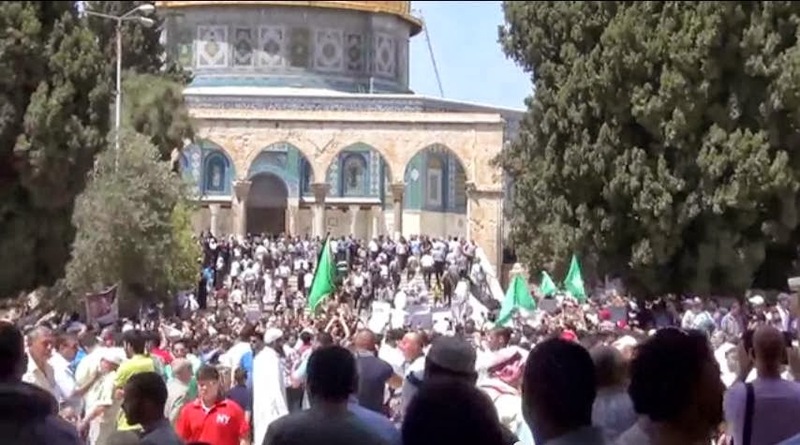 Hamas flags are frequently flown on the Temple Mount. 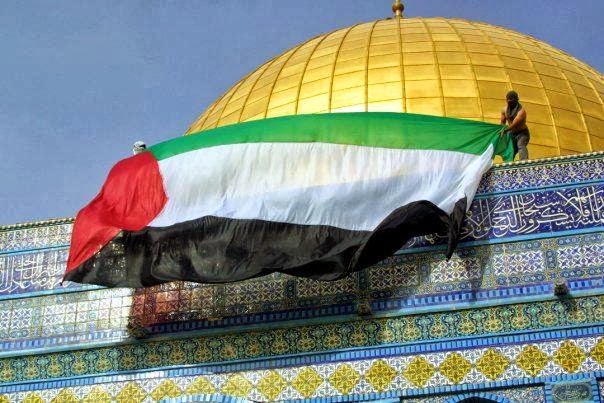 Palestinian flag draped over Dome of the Rock. 2. 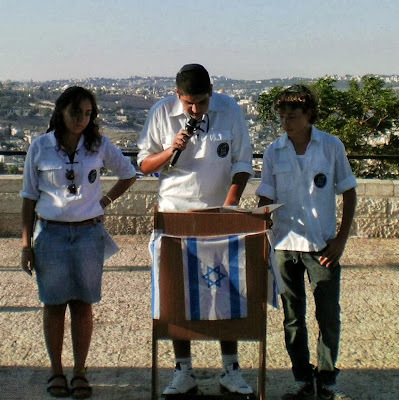 If you are a Jewish male youth, do not pray while on the Temple Mount. Why do young men like you want to spend your time praying anyway? If you try such deviant behavior, your tuhkus will be hauled off faster than you can say, "But I have a right to . . . " Instead, take up the world-wide popular sport of football, aka soccer. 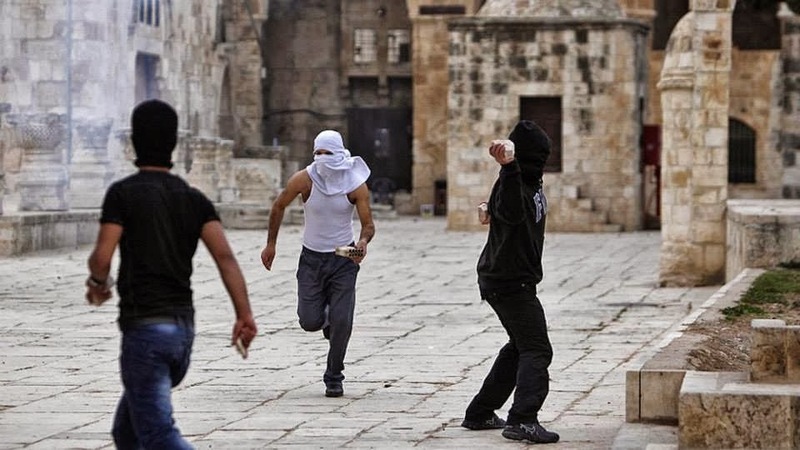 In doing so, you will guarantee yourself hours of recreational time on the Temple Mount. Or if you aren't skilled enough to play soccer, try rock throwing. 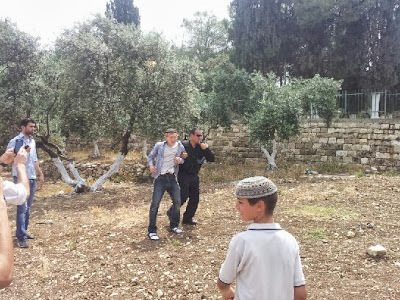 Jewish young man being arrested for praying on the Temple Mount. 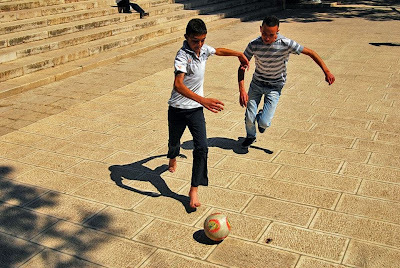 Arab boys playing soccer on the Temple Mount. Arab men throw rocks at Jews on the Temple Mount. This often happens after the Friday Muslim prayers. Go figure. 3. If you are part of a Jewish group wanting to commemorate a special or holy event in your life on the Temple Mount, well good luck with that. However, if you ever have the occasion to celebrate the release of a convicted Hamas terrorist, well then you are in luck. The happy reunion between the terrorist just released from jail and the family can happen right smack on the Temple Mount. Really! No one will stop you. 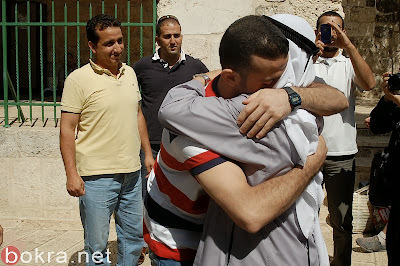 Hamas terrorist released during Gilad Shalit deal hugs father on Temple Mount. 4. 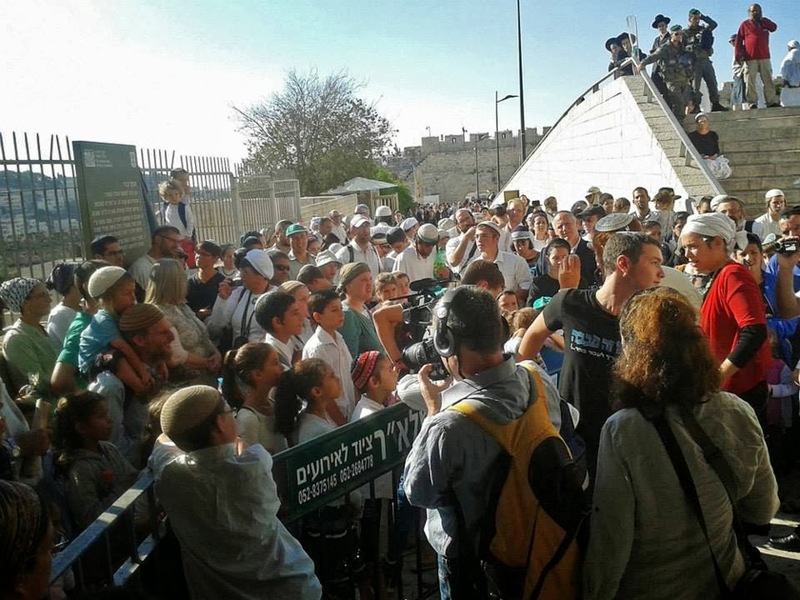 If you are Jewish and want to commemorate a Jewish holiday on the Temple Mount, the answer is hell no! However, if you want to hold a rally on the Temple Mount in support of the Muslim Brotherhood (you know, the group that calls for the destruction of Israel), knock yourself out. Jews were locked off the Temple Mount during a recent Jewish holiday. Recent rally for the Muslim Brotherhood on the Temple Mount. 5. Do not under any circumstances prostrate yourself in reverence toward the place of the Holy of Holies if you are Jewish. If caught, you will be arrested. 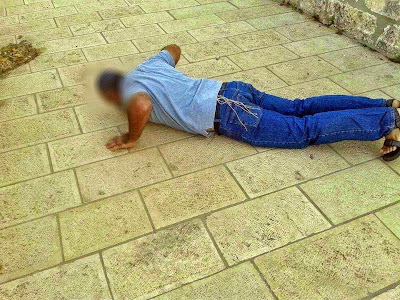 However, if you are an Arab and want to cause an Israeli policeman to lay prostrated, chances are you'll get away with that. 6. 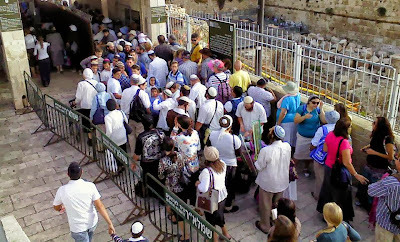 If you are a Jewish child who wants to ascend the Temple Mount on a Jewish holiday, expect nothing but a locked gate greeting your little faces. However if you are an Arab child who wants to ascend on a Muslim holiday, cartoon characters will be waiting to greet you. Woo hoo! Jewish school children recently waited for hours to go on the Temple Mount during a Jewish holiday. Arab children during a recent Muslim holiday. 7. 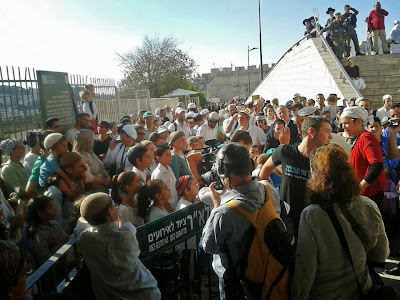 If you are an Knesset Member or a rabbi who was a paratrooper who helped liberate the Temple Mount in 1967 and you want to regularly ascend the Temple Mount, are you kidding? Such unbefitting behavior will not be tolerated. I mean, please, it would give the perception of Jewish sovereignty. 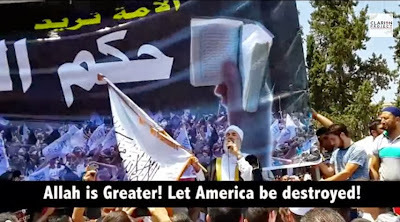 However, if you are a Muslim cleric, representing the "peaceful and tolerant" religion of Islam, you are allowed to give weekly hate speeches, i.e. sermons, on the Temple Mount. MK Feiglin and Rabbi Ariel barred from going on the Temple Mount. 8. 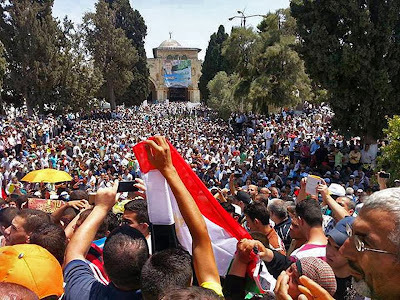 If you hold a youth rally in support of Jewish sovereignty of the Temple Mount you will be told by the Israeli police that posters with the words, "The Temple Mount is in our hands!" are not allowed. Silly kids. What are you doing trying to cause a provocation? What are you doing believing anything other than revisionist history and propaganda? Get with the program! Whatever you do, don't think for yourselves. Ever. At least that's what an idiot would do.